← The Mitford Society Loves…. Born into an aristocratic family in 1916, Lady Ursula d’Abo (née Manners) was interrelated with some of the most powerful and interesting figures of the 20th century. She counted the famous beauty and hostess Lady Diana Cooper as her paternal aunt, and among those famous aunts were Laura and Margot Tennant, part of the Victorian intellectual group known as “The Souls”. Indeed, her mother was Kathleen Tennant, descended from the extraordinarily rich Scots family who had made their fortune in bleach, and she counted the Prime Minister H.H. Asquith as an uncle-by-marriage. There were fascinating cousins, too, including childhood summers spent with Anne Charteris, the future wife of Ian Fleming – creator of James Bond. Lady Ursula’s father, the Marquess of Granby, was the second-born son of the 8th Duke of Rutland, who upon the untimely death of his eldest brother at the age of nine (he twisted a gut from turning a somersault), became his father’s heir. It was a magical childhood, with visits to Belvoir Castle – “my playground and fiefdom” – the Rutland seat, where the vast army of servants extended to liveried footmen and the Pig Man. Although Nanny and the nursery were the centre of Lady Ursula and her siblings lives, she and her younger sister, Lady Isabel, were allowed to ride with the famous Belvoir hunt. The Master of Hounds, terrified that the two children would get squashed in the gates, would hold up the two hundred horses so the girls could pass through first. Occasionally the Prince of Wales, later King Edward VIII, would join the hunt and he and Lady Ursula would gallop the twelve miles from Belvoir Castle to Melton Mowbray. But, following his abdication, Lady Ursula’s father (by then the Duke of Rutland), refused to have him in the house; he was shocked at his betrayal of the country. Furthermore, he and his wife’s loyalties lay with their friends the Duke and Duchess of York, who ascended the throne as King George VI and Queen Elizabeth. Away from the countryside there were swimming and dancing lessons in London, and having been inspired by the ballet, Lady Ursula dreamed of becoming a famous ballerina. 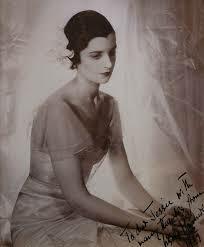 She took lessons with the great Russian ballerina, Tamara Karasvina, who praised her for having “a great aptitude”. However, Lady Ursula could not pursue her training as her parents did not approve of a stage career. The path in which Lady Ursula’s life should progress was made clear, when, at the age of seventeen, the Duke and Duchess of Rutland hosted a “coming out” ball with two hundred guests at Belvoir Castle for her and Lady Isabel. Their matching white tulle dresses were from Worth in Paris, though they proved a disappointment with the girls who longed to appear grown up. In spite of the dresses not living up to expectation, Lady Ursula realised that her coming out ball would launch her into a glamorous, grown-up world. “Suddenly…I was expected to be a young lady with great social graces, and dressed immaculately in the most beautiful clothes.” The freedom “felt exhilarating” after being chaperoned for years. However, to Lady Isabel it was not enough and she eloped with Loel Guinness, an heir to the banking branch of the Irish dynasty. Sailing for over four months on Guinness’s yacht to Palm Springs and New York City, the couple’s honeymoon was so long that it wasn’t insured by Lloyd’s. Although dismayed at her sister missing out on the social season, Lady Ursula went along to the parties and “had five years of growing up in the most enjoyable way”. Change was in the air, and a great event in history was about to draw Lady Ursula to the forefront of British society. The coronation of King George VI, following the abdication of his brother King Edward VII, brought a sense of optimism and pageantry to the people who feared Adolf Hitler and the threat of another world war. As her ancestors had done before her, Lady Ursula and her family took part in the coronation. Her father carried the orb in the procession into Westminster Abbey, her mother was a canopy-bearer to the Queen, and her two younger brothers were Page of Honour to the Duke of Gloucester and Lord Ancaster, the Lord Great Chamberlain. Lady Ursula was one of six maids of honour who carried the Queen’s ermine-trimmed velvet train. Dressed identically, the six girls wore matching tiaras and white satin, puff sleeved Norman Hartnell gowns with a motif of corn embroidered down the front. Afterwards, Lady Ursula joined the royal party on the balcony of Buckingham Palace where she stood next to the Dowager Queen Mary and behind the Princesses Elizabeth and Margaret. At the end of “that magical day”, she was sent home from the palace in a taxi, still feeling quite overwhelmed by all that had happened. But it was not the end of the excitement as Lady Ursula was to discover. A certain Mr. Laurence McKinney from Albany, New York wrote a poem to The Knickerbocker Press, imploring: “In many of the pictures of the Coronation there is shown at the back of the royal party a statuesque brunette with a widow’s peak. Who is she?” The attention, she freely admitted, “produced a lot of jealously amongst my peers”. There were duties beyond the coronation, and along with her mother, aunt Lady Diana Cooper and uncle Duff Cooper, and Winston and Clementine Churchill, Lady Ursula accompanied the new King and Queen on their first official visit to Paris. Being the youngest in the Royal party, Churchill nicknamed her “the cygnet”. Though as much as Lady Ursula had become a society star, her father reminded her that she should set her sights on a good marriage. She recalled: “I had no money of my own and was brought up to be subservient to the male species.” Although she proved her mettle during WWII when she became a voluntary Red Cross Nurse, and then managing two thousand women in a munitions factory, Lady Ursula did indeed fulfill her father’s wish for her to marry. In 1943, Lady Ursula married Anthony Marreco, a man she barely knew and who threatened to commit suicide if she refused to do so. The swiftness in which a wedding was organised prompted the minister to place a chair for her to sit on at the altar as he assumed she was pregnant. This, she admitted, had infuriated her. Ill-suited and separated by war, the couple divorced in 1948. She married for a second time to Erland d’Abo with whom she had three children. The marriage lasted until his death. Lady Ursula has experienced a life of many high and lows set to the backdrop of a gilded age, the like of which we will never see again. All of this has been recorded in her charming memoir, The Girl with the Widow’s Peak. a blessed hundredth birthday to Lady Ursula! !